Do you have the next BIG idea in business? Ready to compete for $10,000 in prize money? 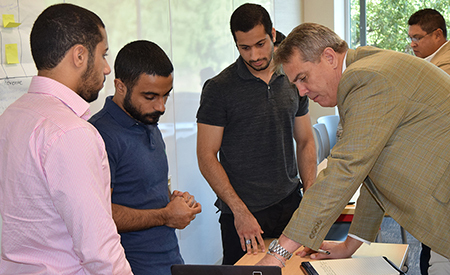 The New Venture Startup Competition (NVC) cultivates the entrepreneurial spirit in students at the University of the Incarnate Word. The 13-week competition, held each fall semester, allows students to develop a business model from idea to actualization. The winners take home $10,000 in prize money for their startup business. Second prize is $2,000. Teams will cultivate their innovative ideas with help from mentors in the San Antonio business community and through several workshops held throughout the competition. The New Venture Startup Competition is open to all UIW students – undergraduate and graduate – regardless of major or program of study. In fact, cross-disciplinary teams are encouraged. Students can only participate in teams of 2-5 people. Individual submissions are not allowed. Students are restricted to participation on a single team to avoid conflicts of interest between business ideas and lack of commitment to one particular business idea. The list of team members registered at the start of the competition may not be modified during the competition. If a team member is dismissed from or voluntarily quits the team and the remaining team comprises less than two members, that team is no longer be eligible to participate, and will be dropped from the competition. The proposed business idea must be wholly owned by the participating students for the duration of the competition, and may not infringe upon the copyright or other intellectual property right of any third party. Prior UIW Business Plan Competition award winners are not eligible to enter the same business plan or a spin-off of that plan. Teams or team members that have received a previous prize or funds from UIW can compete as long as their business idea submission to the New Venture Competition is completely different from their prior Business Plan Competition submissions. The final determination of eligibility is made by competition administrators. Each team can submit only one business idea. Proposed ventures must be projected to be financially profitable, be lawful and create jobs. The proposed venture must complement the mission of the H-E-B School of Business and Administration, as well as the University of the Incarnate Word. All entries must be the original work of the students and free from any claim of copyright, patent or other restriction. The business idea should not be in violation of any intellectual property rights. This competition will accept only ideas for new and independent ventures in the seed and startup stages. Submission of proposals to acquire an established company to improve its management, or ideas to create a hedge fund or any other type of venture capital fund will be rejected. Participants who make it to Phase 2 of the competition are required to participate in all the activities associated with the competition. Participants should respect community values, such as honesty and integrity. The administrators of the NVC reserve the right to remove students who enter business plans for ventures or proposed ventures that are offensive, illegal, and/or that are inconsistent with the values of UIW. Plagiarism of ideas will result in disqualification. Each team will be assigned a mentor to serve as a professional source of feedback and advice throughout the competition. Mentors are local business leaders, entrepreneurs and professionals in their respective fields. The mentor relationship is vital to the success of each team. Each mentor will share a practical point of view on the team’s business idea based on his or her experience and knowledge. Each team will be assigned a mentor by competition administrators based on the expertise of each mentor as it relates to a team's business idea. The New Venture Startup Competition is divided in two phases, with teams needing to perform well at several checkpoints to continue in the competition. Phase 1 begins September 12 after teams are notified that their idea has been accepted. Once an idea is accepted, teams are mandated to participate in a series of workshops where students will learn design thinking skills including brainstorming, team skills, networking and business model innovation skills. Also in Phase 1, a mentor will be assigned to each team to provide professional feedback throughout the competition. Each team will submit the final version of their Business Model Canvas by October 26. On the same day, teams will participate in a Trade Fair to showcase their business model prototypes, product samples and/or description of services. This activity is to support the Business Model information and get feedback from those in attendance. Students should be present to describe and explain products and services. Phase 1 finalizes with the announcement of the teams that will advance to Phase 2. This announcement should be made on November 2. Is the business model viable, feasible, fundable and likely to succeed? Is the idea creative and innovative? Is the plan complete and does it have sufficient analysis? Is the written and oral presentation of appropriate quality? Does the plan have a significant impact on the community? The teams chosen to move forward to Phase 2 will begin putting together their Business Project in the online UIW Adventurees Platform. A series of workshops will be offered to introduce teams to the platform and to give details of the content required for the final evaluation. November 30 is the deadline to complete all the information required in the UIW Adventurees Platform. Teams will make a final 12-minute presentation to the judges on December 7. Judges will then have 5-6 minutes to pose questions to the teams. After all presentations, the winners of the 2018 New Venture Startup Competition will be announced. Judging Criteria for Phase 2 – The panel of judges will be comprised of San Antonio-area entrepreneurs, venture capitalists and investment bankers. The judges will respect the confidentiality of each team's business plan. Judges agree not to initiate a professional relationship with teams during the competition. Participants are not allowed to contact the finalist judges, and judges are not allowed to contact any participants during the course of the competition. Any such behavior will result in the disqualification of the participant and his/her team. Registration for the fall 2018 New Venture Startup Competition is open August 20 - September 7. The deadline to register is Friday, September 7, 2018. The faculty administrators for the New Venture Startup Competition are Dr. Adesegun Oyedele and Dr. Jose Moreno. The event is co-hosted by the H-E-B School of Business & Administration and the Collegiate Entrepreneurs' Organization, UIW chapter.